With Love From Rachel: e.l.f. cleansing cloths are fantastic brush cleaners! e.l.f. cleansing cloths are fantastic brush cleaners! I received a discount code from e.l.f. a few weeks ago for 50% off my order (another reason to love them; they are always having great sales). I have enough cosmetics at this time to cover New York Fashion Week on my own, but I had to use that code, right? I decided to try their Makeup Remover Cleansing Cloths since I had never used them before and they had some good rating on their website. It also helped that they are $3, since the other ones that I had looked at were MACs and they were around $15. I tried them several times as eye makeup removers prior to my actual cleanser (there is just no way that I can solely use a cloth - I need my cleanser). They worked pretty well, but it just seemed like an extra step that was not necessary. Then it hit me; why not use these to clean my brushes in between their monthly baths?? They worked amazingly. 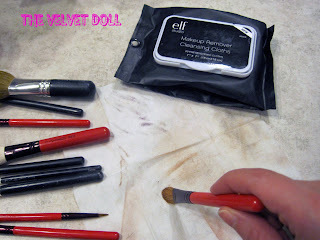 I lay a cloth out on my counter a few times a week and lightly swipe my brushes over them. They remove almost all of the makeup from them without leaving a residue, and the brushes are ready to go in 10 minutes instead of having to dry for hours. I have even used them when using my MAC 224 brush for several different colors in one look. They are gentle enough to remove the color from the brush while leaving it ready to be used in another color. For $3 I truly think that makeup artists should have these cloths on them, and anyone else who LOVES makeup! Great post! I'm using my new 'Essence of Beauty' brush cleaner, which works great too and isn't that expensive either! I agree! And one of my blushes came and was not right- it had bubbles in it and was all seperated. I emailed them about sending a new one and they wanted me to ship the other. I guess I should have, but um, I threw it out because it was GROSS!! ooh i really want to try these now! I found you on beautylish & am now following you. I love E.L.F. too and will have to try these. I have a new blog, take a look if you have a chance.